Welcome to day four, the final day, of our reveals for our July Release! This month we are celebrating the FOUR year anniversary of our company! That means an extra big release with new stamps, new dies and new stencils! If you missed the stencils, make sure to pop over and check out our reveal post from Monday here! 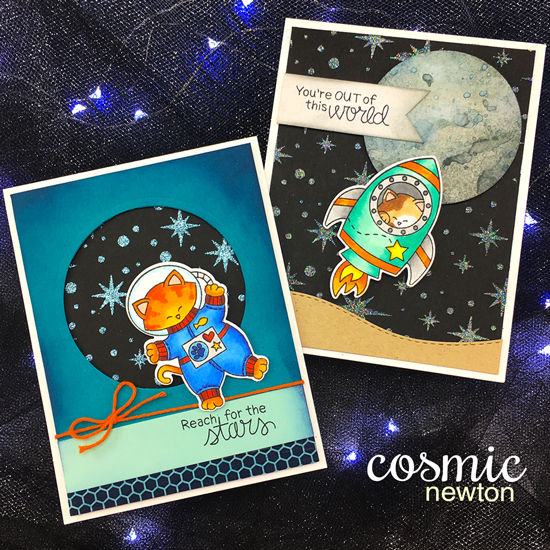 Today we are revealing our adorable new Cosmic Newton Stamp Set and coordinating die set. We are also giving away a $20 store credit each reveal day to one lucky winner so make sure you read all the way to the bottom of this post to see how to win!! And make sure to pop back tomorrow for a big 4 Year Celebration blog hop too! 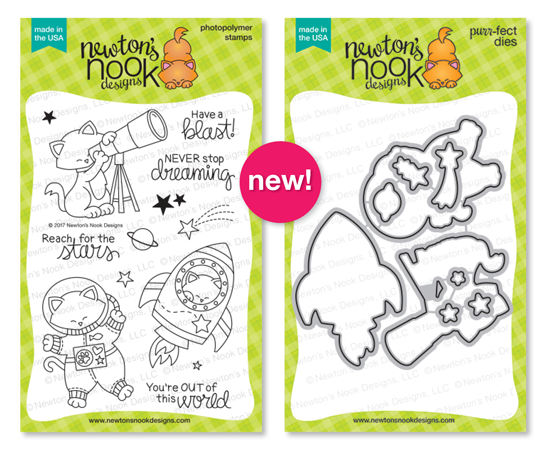 Blast off with Newton in this space themed 4 x 6 stamp set! First, Newton is dreaming of the stars while gazing through his telescope! Next, he's blasting out to space in his space rocket, complete with a kitty space suit! This adorable set is also filled with uplifting sentiments that will be perfect for sending inspirational cards to all your friends! Reach for the stars with these adorable projects from our Design Team! 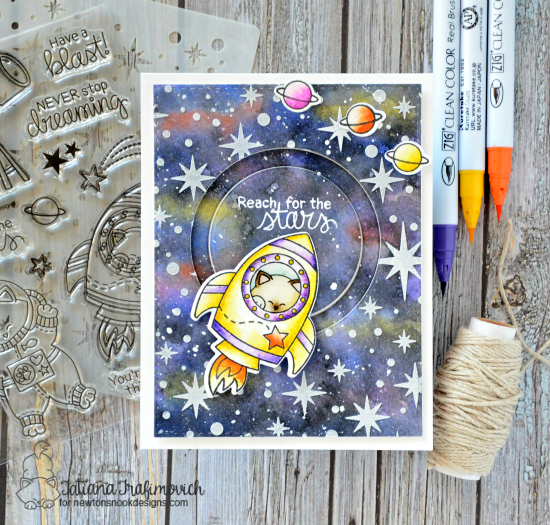 Tatiana created a this gorgeous space card with Newton in his little space rocket on a spinner! She also used our new Starfield Stencil in the background too! 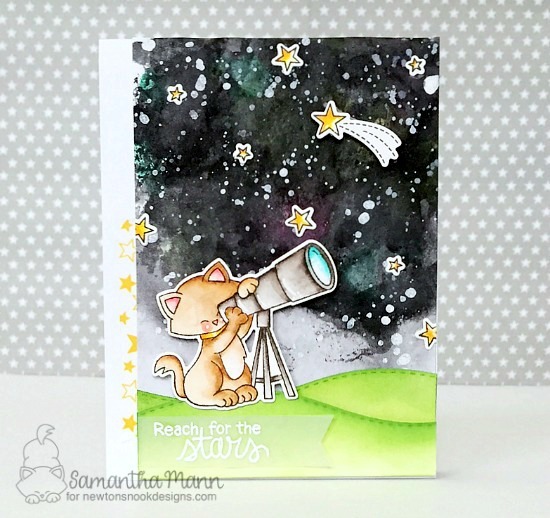 Newton is so cute looking into space through his telescope on this card by Samantha! That starry sky she created is amazing! She also used our Land Borders Die Set to create the hills on the bottom of the card. 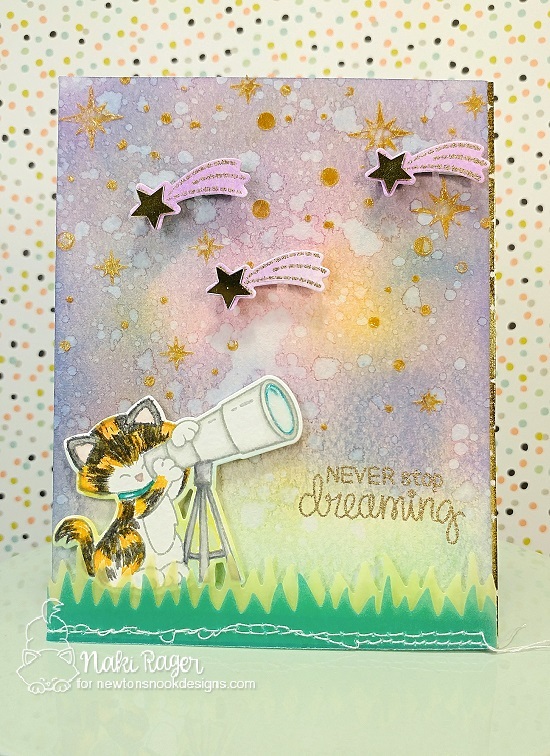 Jennifer used our new Starfield Stencil to create a fun starry sky background. Then she added Newton shooting off in his fun purple space rocket! Nakis created this lovely scene with Newton watching shooting stars through his telescope! She used gold embossing paste with our new Starfield Stencil to create gold stars on that lovely purple sky! She also added in grass along the bottom using our Land Borders Die Set. 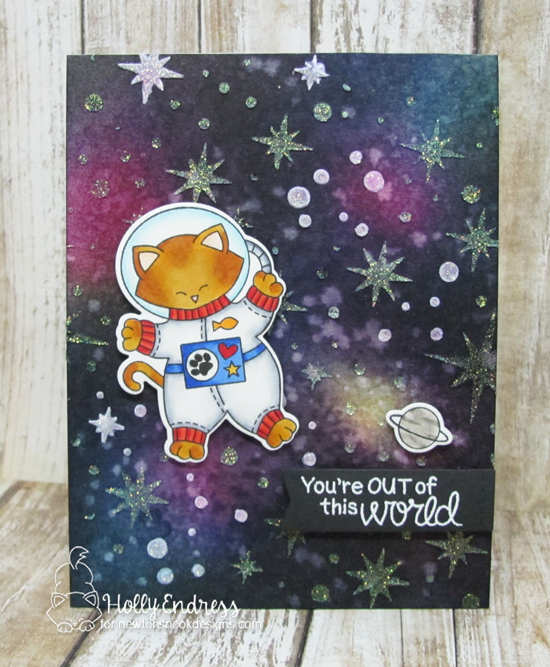 This card by Amanda is twice as cute with the two kitties in space! I love her vibrant coloring on both images! She also used our new Starfield Stencil to create a sparkly star background! Juliana created this awesome card using Newton in a rocket colored in red and blue! 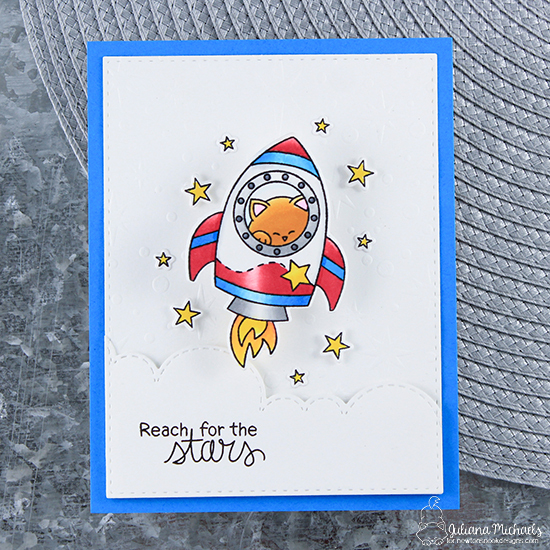 He's rocketing up past the clouds that she cut out using our Sky Borders Die Set. She also added a subtle star texture behind the image with white stars using our new Starfield Stencil! 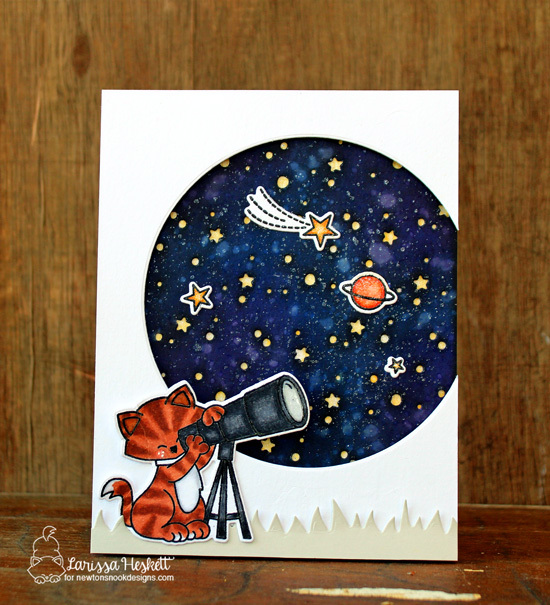 Larissa created this stunning card with Newton looking into space! She created a whole galaxy inside that big circle! She also added in some grass along the bottom of her card using our Land Borders Die Set. Newton is so cute in his spacesuit! Holly created an awesome galaxy background for him to float around in using layers of texture with our new Starfield Stencil. (you can see how she did this in her video here). This card by Ellen is so adorable! Newton is looking our the window into the night sky! Make sure you check out Ellen's blog today to see the stunning scene on the inside of this card too! Seriously all of these cards are amazing! They are all so different in design but all are incredible with the amount of detail, the colouring and the scenes that have been created are fantastic. Adore this stamp set! I have to have it! Just purrfect. This is a cute stamp set. What fun cards! I really enjoyed seeing how everyone used this set, and the outer space backgrounds are fantastic! Love this cosmic set for Newton. My husband and several sons work at NASA so I like this type of set. So fun to see the different way each person colors Newton too! This new set is out of this world!!!! Congrats!!!! Our favorite cat goes to outer space - how fun! in this set. I love your DT - the coloring is just superb! Gorgeous galaxy backgrounds and astrocats - I love it! So, first off, I'm not a cat lover. HOWEVER, this set is beyond adorable! Really, really cute. New stamps are out of this world! Great cards. Cosmic Newton is definitely out-of-this-world. My husband took a look at it and told me I had to get it. We have cats and one of my husband's hobby is Astronomy. Great release! Wow! Amazing inspiration from the design team. Another fun Newton stamp set. This is a very cute stamp set. This release is so much fun. Newton in space, I didn't see that one coming. Adorable!! 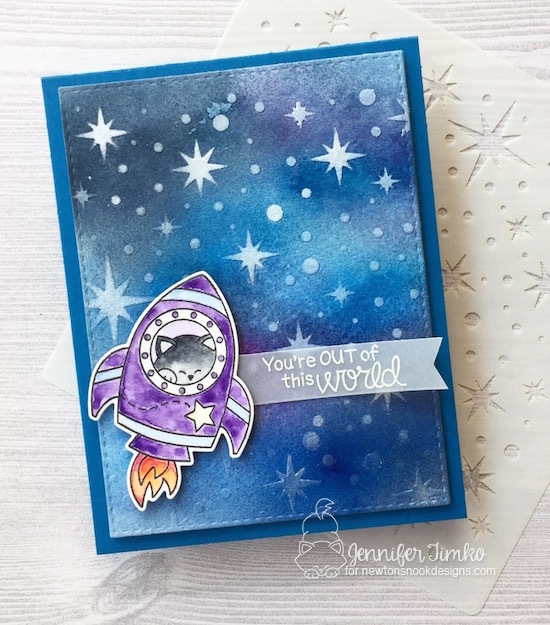 Such fun space themed cards! Very fun space themed stamps...great DT designs. OH how fun is today's release! Wonderful work too! Oh I love today's reveal..tooo cute!!! Loving the new releases and Newton's newest adventure into space! Thanks for all your creativity and sharing it with is! Such an adorable set! Love all the DT cards! This set is really spacy! It's great! Great stamps set ! And with the stencil..... fabulous match !